The Roswell Girls Softball Association’s 2012 season is drawing to a close and that will be one more listed in the Slugger chronicles. Unfortunately the Sluggers didn’t do as well as we all had hoped. An 8 & 8 season isn’t horrible but I know they could have done better. I still have photos and videos to upload so keep an eye open for those. 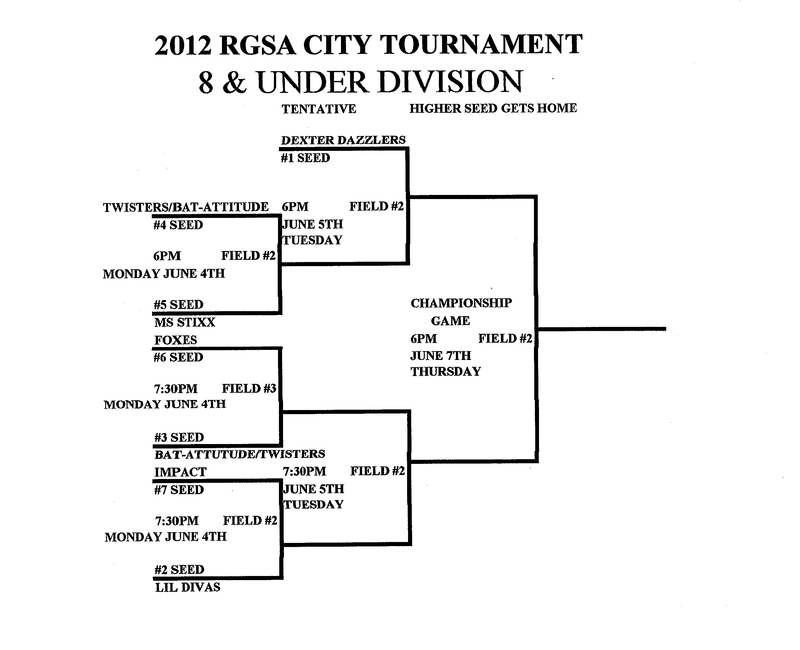 For now I have information on next week’s city tournament. 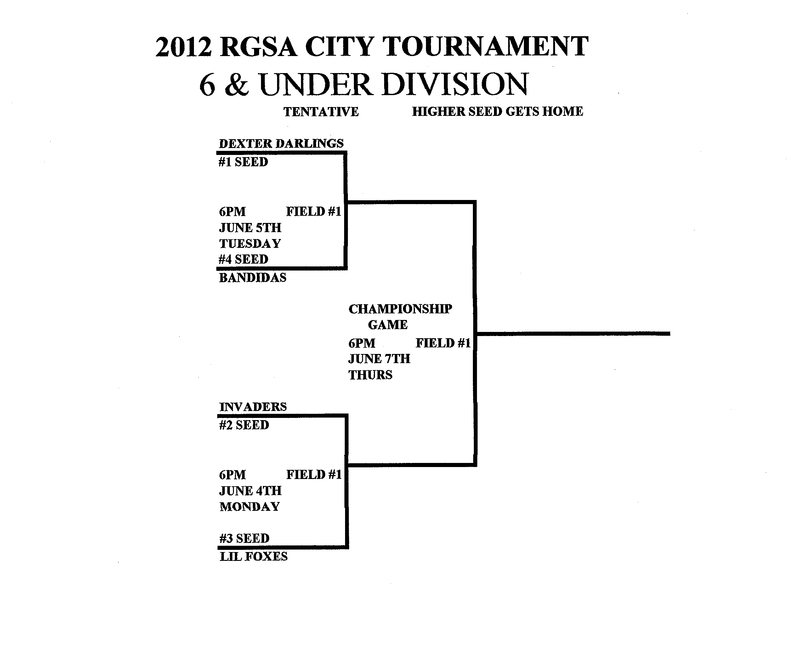 The 2012 RGSA City Tournament will take place next week the 4th, 5th and 7th of June. Here’s the info and brackets I received from the board. For pdf copies of the following brackets you can download them by selecting the following links – 6U, 8U, 10U or 12U. 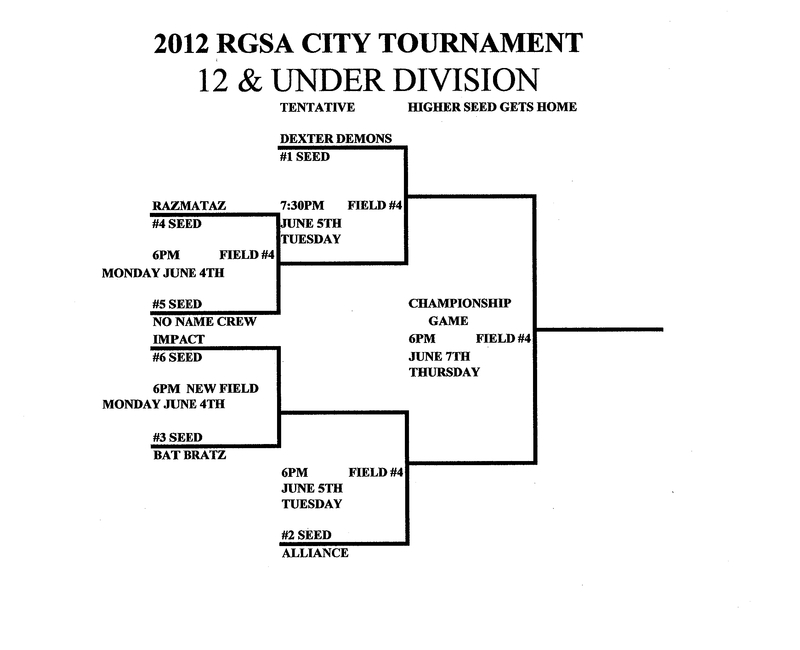 You will notice there are only four teams in the 10U division. The X-Plode team has pulled out of the tournament and forfeited the last of their season games. Closing ceremonies will be after the conclusion of the championship games on Thursday June 7th @ 7:30pm on the 8U field. Each team is encouraged to be there and will get a hot dog / chips & water for dinner. Please have every girl wear their jersey for team support. 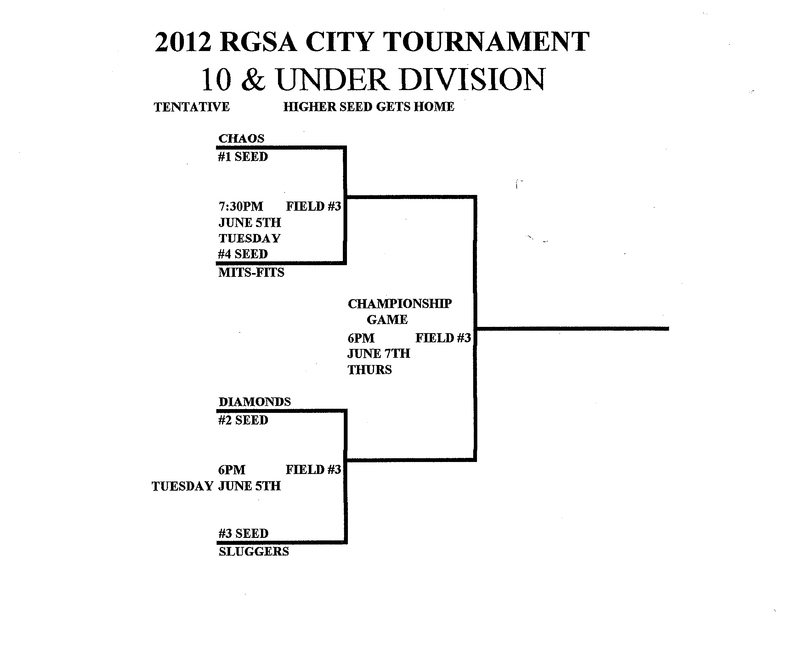 Championship games will start Thursday night June 7th @ 6pm. This entry was posted in Roswell Girls Softball Association and tagged #1 seed, #2 seed, #3 seed, #4 seed, #5 seed, 10U, 12U, 2012 RGSA City Tournament, 6U, 8U, Alliance, Bandidas, Bat Attitude, Bat Bratz, Championship, championship games, Chaos, Dexter Darlings, Dexter Dazzlers, Dexter Demons, Diamonds, Fastpitch, Foxes, girls, girls softball association, Invaders, Lil Divas, Lil Foxes, Mits-Fits, Ms Stixx, No Name Crew, Organizations, pdf copies, Razamataz, RGSA, Roswell, Roswell Girls Softball Association, season games, Slugger, Sluggers, softball, Sports, Tournament, Twisters. Bookmark the permalink.